What Are the Signs That Budgies Are Going to Breed? Putting a male and female pair of budgies (parakeets) together in a cage doesn't mean they are automatically going to breed, or even that they will like each other enough to want to breed. There are many factors involved with encouraging birds to mate and brood eggs. The timing and atmosphere must be right, and the birds must be ready to breed, which is why it's important to know what to look for. Wild budgies have a certain time of the year when they come into condition for breeding. It usually takes place shortly after they have molted, found a place where there is sufficient food and when the daylight hours are extended. In other words, they naturally breed in the summer months when the days are longer and warmer, and there is plenty to eat. Budgies also must feel safe to begin breeding. There is such a thing as breeding condition, which means that there are physical changes in the bird's body at the time when the bird is ready to breed. 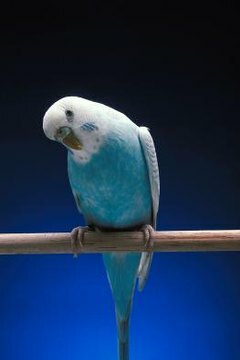 When not ready to breed the male bird's cere (the fleshy area at the base of the beak where the nostrils are) will be a light, mottled blue shade. When the male is ready to breed the cere turns darker blue and loses the mottling. The female parakeet's cere is a light blue color when she is not ready to breed. This is her most infertile time and trying to breed her at this time can result in infertile eggs. When she is getting closer to breeding time, her cere turns from blue to an off-white. When she is at her peak breeding condition her cere turns a deep tan shade. This is when her fertility is at its best. Budgies spend time flirting with each other, by nibbling gently on each other, grooming each other, and touching beaks. They twitter at each other as if deep in conversation. The male shows off for the female, making noises and fluttering. He may display his colorful feathers for her. The female chews up paper for a nest when she's ready to breed. The male might feed the female regurgitated food as he would if she were on a nest. If the pair can be convinced to breed at all, when they aren't ready, the birds likely will lack motivation for the normal breeding process. The female probably will lay at odd times and possibly lay infertile eggs. Any eggs that actually are fertile and fertilized by the male could be abandoned by a hen that is just not ready yet. Chicks that hatch might not be mothered properly or even be abandoned by the parents. Budgie Breeding: If You Want to Get Into Breeding Budgies or Parakeets, Everything You Need to Know is Here. Cute Little Birdies Aviary: What is Breeding Condition? What Are the Signs of Parakeets Mating? Why Aren't Our Budgie Eggs Hatching? How Do You Know When a Duck Is Going to Start Laying?